One key reason it’s so difficult, if not impossible, to ever reverse, or even slightly reduce, an entitlement program is how the news media become advocates for the program. So, as expected, in the wake of the federal district court ruling Friday night declaring ObamaCare unconstitutional, ABC, CBS and NBC all found an example of someone who would be hurt by losing ObamaCare. Over the past few weeks, the broadcast networks -- and especially CNN and MSNBC -- have promoted claims by Democrats that thousands of minority voters in Georgia have been discriminated against because at least 53,000 new voter registrations were put on hold as "pending" until mistakes could be corrected. But those same networks have ignored recent revelations about why those applications were put on hold in the first place that discredit claims of racial discrimination. On Friday, the CBS Evening News was the only one of the three broadcast network evening newscasts that informed viewers of revelations that Hillary Clinton in 2008 allowed an advisor, Burns Strider, accused of sexual harassment to remain a part of her campaign -- thus demonstrating another example of hypocrisy by the former Democratic candidate. NBC Nightly News was all in on praising Hillary Clinton Tuesday, even going so far as to run a segment tilted “Kids React to First Woman Nominee.” “No matter what your politics are, no matter what happens in November, history is being made right now in this country, as it has its first woman presumptive nominee of a major party,” stated NBC’s Lester Holt, leading into the segment. Introducing a report on Monday's NBC Nightly News about a New York City ban on large sugary drinks being overturned by a New York State Supreme Court judge, anchor Brian Williams touted how Mayor Michael Bloomberg "is saying this isn't over yet." In the report that followed, correspondent Rehema Ellis proclaimed: "In a city of more than 8 million, where health officials say the obesity epidemic is responsible for more than 5,000 deaths a year, the Mayor says his fight to make New Yorkers healthier will continue." At the top of NBC's Nightly News on Wednesday, anchor Brian Williams teased a story on charter public schools: "In our 'Education Nation' report tonight, the agonizing lottery for kids and their families to get into the best schools, but are they the best schools?" He later declared that families "put everything on the line for a coveted spot in a charter school, but do these schools really deliver?" Introducing a report by education correspondent Rehema Ellis, Williams touted her examining "the questions being raised about whether charter schools are truly better schools." After detailing anxious parents hoping their children would win a lottery to attend a charter school outside of Atlanta, Ellis warned: "For all the excitement around charter schools, there is also growing concern that, overall, they may not be the answer for what ails America's public schools." As the Texas State Board of Education worked to complete its once-every-ten-year revision of the curriculum for the state’s schools in May, much of the mainstream media promoted complaints and distortions from the left – many originating with the left-leaning Texas Freedom Network – about the nature of the changes in the guidelines and how they would effect textbooks that might end up in other states. One of the more incendiary distortions was that the conservative-leaning Texas Board of Education was trying to downplay or ignore the existence of slavery in America’s history as some on the left claimed that the term "slave trade" was being renamed "Atlantic triangular trade" thus removing the word "slave" or "slavery" from the curriculum. 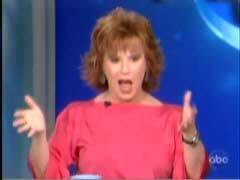 Joy Behar of ABC’s The View and of HLN’s Joy Behar Show went the furthest in slamming the board of education as she charged on the May 17 The View that "It's called revisionism. People do it about the Holocaust, and now Texas wants to do it about our country." She soon mockingly declared: "You know what, next they'll be burning books. Next step, burn books." NBC’s Rehema Ellis mentioned the issue on the NBC Nightly News on two consecutive nights, on the May 22 show charging, "And the expression 'slave trade' would be changed to the 'Atlantic triangular trade.' Some critics see that as a move to deny slavery," while ABC’s Dan Harris on the May 21 World News asserted, "Here are some of the things the conservatives tried and failed to do: Have the President called by his full name, Barack Hussein Obama, which some called an attempt to raise questions about his faith, and even rename the 'slave trade' as the 'Atlantic triangular trade.'" But CNN’s T.J. Holmes deserves credit because he actually took the time to inform viewers of the wording in question, first as he, on the May 22 CNN Saturday Morning, hosted a debate between NAACP President Benjamin Jealous and Jonathan Saenz of the Liberty Institute, with the CNN anchor revealing that the new wording still used the word "slavery" as he posed a question to the NAACP president. Holmes: "I want to make sure, because I read this thing as well and I did see 'Atlantic triangular trade' in there, but then in the next, almost couple of words I saw the word 'slavery' ... Now, what is the issue with that that you call it a 'triangular trade' and then you're still talking about slavery and you used the word ' slavery'? What's the issue?" - What do you say to people who say that you are, in essence, imposing your political and religious views on school children? - If the Founding Fathers really wanted this to be a Christian nation, why is there no mention of Christianity or Jesus in the Constitution?